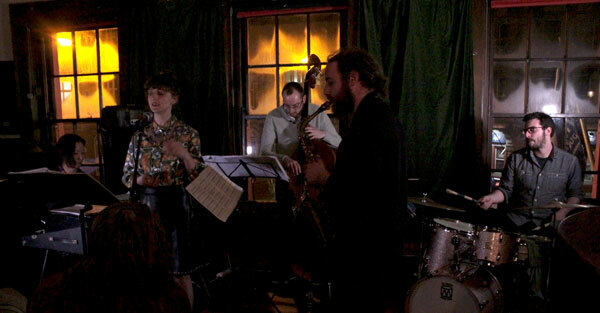 Fuzzy Logic Ensemble is the first Irish improvising ensemble in a long time, to be curated by a composer rather than one of the groups performers. The group is made up of some of my favourite Irish musicians; all of whom have my greatest respect for their endless talent, creativity and individual voice. The music performed by this group, is virtuosic, innovative and full of energy. It is said that the best jazz music is a conversation between its members, a musical discussion. FLE pushes this metaphor closer to reality then ever before, in that the material deals in part, with music inspired by speech melody. Over the last few years I have been developing techniques to use speech melodies and rhythms in my compositions and this group is the logical pinnacle of that exploration. This is a monster group with a lot to say. Using the name "Small-Tet", is a tribute to one of my favourite composers George Russell, who died in July 2009 at the age of 86. His "Small-Tet" from 1956 featuring Bill Evans is one of my all-time favourite Jazz groups.